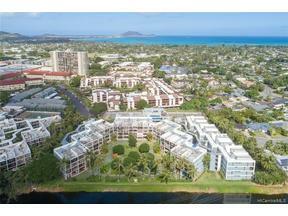 You'll love this sophisticated ground floor unit with a resort-like ambiance in the heart of Kailua town! Capture the sights and sounds of waterfalls, birds chirping, ducks swimming all surrounded by a landscape of koi ponds and manicured tropical gardens. Peace and tranquility describes this gem, remodeled in 2012 with designer kitchen/baths, hardwood bamboo floors, and automatic shutters on your 120 sq. ft. lanai. Amenities include a tennis court, pool, Jacuzzi, sauna, extra storage, and more. Two convenient parking stalls on the same level. Pets allowed. 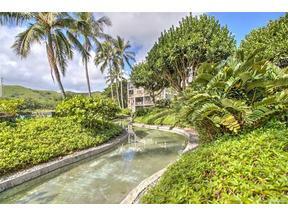 Enjoy the lifestyle of Kailua's small community with nearby boutiques, small businesses, eateries, and of course the gorgeous beaches for all you water sports enthusiasts! Click on the video tour to see this fantastic unit. This is not your typical short sale, VA loan. Seller is not in default, lender can close in 30 days. Attractive assumable loan option as well.